After their previous victory against the forces of dark Rayman and his friends grew complacent. They lowered their defences and succumbed to sloth, sleeping for about a 100 years. And the creator who spent his early days meditating was now reduced to a frail old man smoking his pipe listlessly all day long. It was a sad state of affairs. No wonder then the evil magician who returned from defeat stronger than ever, had little trouble conquering the glade of dreams. The 10 princesses were kidnapped, dragons were unleashed and the teensies were imprisoned. And all this was done while Rayman and his friends were blissfully asleep. Any one would be indignant at the conduct of these "guardians". I was very disappointed in Rayman to say the least. I mean it is one thing to be defeated after a hard fought battle and quite another to surrender, nay loll around while the enemy is plundering your land. I would not think it unreasonable to assume that being awake on a battlefield came as a part of the job. Nor would it be improper then if, under these circumstances, some proud citizen of the glade were to walk up to these bums and register tight slap on their faces to rouse them from their eternal slumber. No no no. The malady was identified. The remedy was prescribed. The dose was administered by a wise fly ,which looked like a toad, and went by the name of Murphy. A right hand on their cheeks and they were up and ready to serve. Reporting for duty: Rayman and co. Their mission? To rescue the princesses, to free the teensies and to defeat the evil magicians. 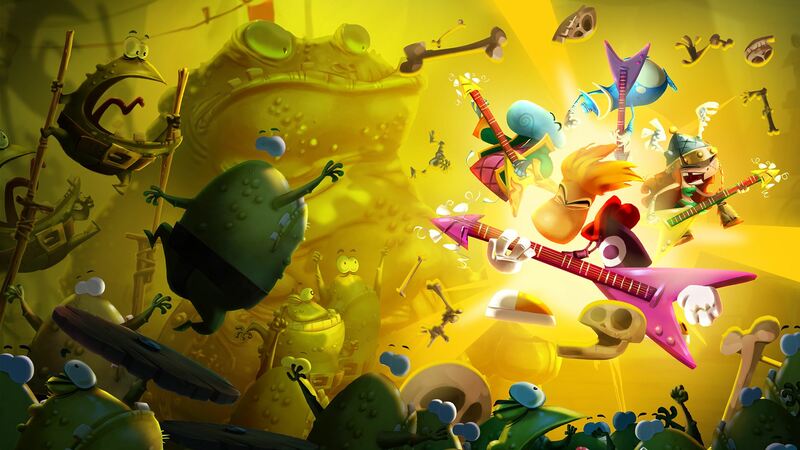 Rayman legends is follow up to the super fun platformer Rayman Origins. You get to play as Rayman or one of his friends as you jump around, punch and kick enemies to free the teensies and defeat the evil magician in each world. The structuring of the stages is similar to origins. The snoring tree is gone, instead you choose the worlds to visit from a "gallery" of paintings. Once you've chosen a stage to play the game is almost similar to origins. The game is packed with with incredible detail. The backgrounds are colorful and vivid. The objects are brought to life by charming animations. Even the not so important things like the collectibles have a personality of their own. The lums (gold in raymans world) for instance hang out in clusters. The yellow colored ones are sleepy and drift around with drooping shoulders. The purple ones on the other hand are quite cheerful and one can often catch them jumping and dancing around infusing every one with their infectious energy. The purple lums can often be found leading the yellow lums even as they sleep. The enemies in Rayman Legends are just as colorful. Now normally they go about their work of destroying raymans home in a very nonchalant -- almost business like manner. But you can often catch them taking a break from duty to play ball,torture the teensies or do some other silly stuff. Don't be surprised to find a pirate using a teensy prisoner as a bait for fishing when they should be ... I don't know burning, plundering and doing other piratey stuff? But in a way it's understandable. After a while all this evil stuff takes a toll on you. Everybody needs some time to recuperate. Yes even the villains. This fellow was supposed to be the wise old monk. Rayman offers a good selection of playable characters. Besides Rayman himself there is Globox, Teensy, Murphy (an assist character) and the ten princesses. Among these Barbara quickly became my favorite character. She is a teen princess (with one missing canine) of the jungle/castle world, enjoys hard rock every now and then and often using her axe as a prop to play air guitar (YEAH!). You can watch her in her full glory in the castle rock level where she beats the baddies and fights the dragon while listening to the metal playing in the background. Pump it up! The sound design in general is excellent. Since the theme of the game is a bit darker as compared to origins the background music is heavier and moody as well. Oh well Pump it up! There are a few mini games as well. Like "scratch me baby". Yeah I know given the vita's reputation for somewhat risque(to put it mildly) games I was a bit circumspect trying it out in the open. I was surprised however, at night in the privacy of my room, that it was harmless ticket scratching, lottery themed game that rewards with a few in game prizes if you win. 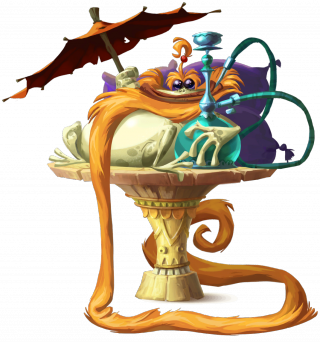 There is also a "creatures" house where Rayman keeps all his pets. Now these pets perform a very valuable job. They are Raymans source of passive income. Everybody has a passive income source these days and Rayman won't be left behind the times. No sir. Every time you complete a stage these creatures pop out shiny lums for you to collect. All that gold for free! "And what does rayman do with all this gold? " Rayman buys for himself and his friends fancy dresses which you can have them try on at any in the "heroes" locker room. One might be inclined to think that Rayman and co are vain but I feel that some indulgence is acceptable especially when you render such an invaluable service to your country. Sure they slept for a hundred years and were responsible for the current state of affairs in the first place, but they are trying very hard to make it up to the people. Let's not be too hard on them shall we? Rayman Legends offers an excellent value for money. Besides completely new levels, all of the stages of rayman origins make a comeback. 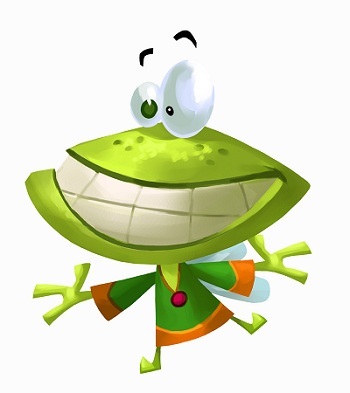 As I have had the opportunity to observe before Rayman origins is perhaps the happiest game of all time (at the very least it is a close second to loco rocco). Rayman has a heart of gold. You can feel it in his kind,smiling face. He is quick to admit his follies and even quicker to correct his mistakes. Is he perfect? No. He's got his flaws. But who hasn't. In my opinion rayman is a legendary warrior. Very underrated. I would say uncelebrated (Mario isn't the only do-gooder princess rescuer you know) but legendary nonetheless. Don't wait any longer for a chance to play his game.